Eighteen miles south of San Angelo, Texas, nature enthusiasts are welcome to visit the Hummer House located near the banks of the spring-fed South Concho River. 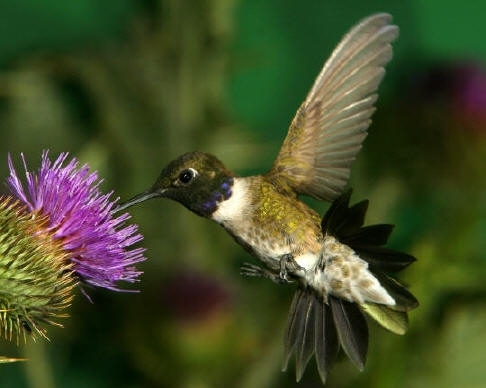 While this west Texas oasis is unique for its natural beauty, it is distinguished from other wildlife habitats because of thousands of tiny hummingbird inhabitants. The Hummer House is the summer home to Texas' largest concentration of breeding Black-chinned Hummingbirds. Numerous bird species are native to the area and are joined by migrant birds as the season change. The largest number of deer are seen during fall, winter and spring. Wild turkeys migrate into the thickets with their young in September and groups number into the hundreds. Breeding season is completed by mid-April with a few remaining to nest in the area. Visitors are encouraged to enjoy this wildlife habitat by staying in one of three cottages. Each cottage offers privacy in the natural setting of live oak and pecan timber. Day visitors are welcome to visit the observation room on Saturdays in the months of APRIL through JULY. Join us and experience nature at its finest!